Tokyo has no shortage of sight seeing spot and unique architectures. You never be dismissed wherever you go, but I’ll introduce some of my favorite places, just in case you are too indecisive to go. You can also read my interview in the latest Tokyo Weekender. Capturing a famous icon with a unique way is always challenging, but still you have some room for it. I could do with my way style, so you do. It’s not a tower actually but a unique building in Shinjuku. But don’t close the facility too much with your tripod, then a security come for stopping your activity. Take a moderate distance from it. The building is curved and distorted, not by an natural disaster but was designed initially so. Ginza is so very fashionable district, where pretty neat and clean, that your wife or girlfriend are happy to come with you to “De Beers“, a diamond company. Just take care not to inside the building with them. This is one of my favorite bridge in Tokyo. It’s so popular that I bet you’ve already have seen it in so many photo somewhere in the Web. Still you have to visit there on your own and try to shoot your version of “the Rainbow bridge”. After shooting the rainbow bridge, if you have a little time, why don’t you stop by Ariake Junction? Is Junction an architecture? Maybe, maybe not. I don’t care of the definition of “architecture”, . I just care about “beauty” of the structure. The combination of the highways and pillars certainly forms the city scape in Tokyo, where you should not miss while your stay in the mega city. If you had a bad weather while your stay in Tokyo, why don’t you go to anywhere inside: Tokyo international forum is the best place for you. The well designed, Si-Fi looking interior definitely catch your eyes. I bet you can spend whole day there. After all you should not miss now the highest tower in Tokyo. Just go and climb the tower, so you can get the astonishing view. Get tired of the crowd there? Just having 5 minutes walk, there is the famous spot, on the small bridge, where you can shoot the complete reflection of the tower. I’ve been introducing some of my favorite and popular places, but if you crave a unique image, find your favorite place where you can’t find in any guide books or the Net. So here is a blank space for you. Just walk around the hotel you stay, or just go to an non-sight seeing spot with your hunch. I always can find an interesting subject around or on the way to my initial destination. And always, it was much interesting for shooting them than already-shot-staled popular subjects. I watched the movie the othenight. It was soooouuu Good. Despite of the result of the box office (I don’t believe in, or rely on that), I really loved it. The whole visual was astonishing, sound and music were remarkable. Since the original “Blade Runner” is one of my favorite movie, so I was pretty happy to see the amazing sequel. As a sound designer I ‘m all ears when it comes to sound. If you are interested sound, check it out the behind scene of the movie. I enjoy seeing the recent CGI SiFi movies, but my favorite movies are all from 80’s. Blade runner(1982), Terminator (1984), Tron(1982), Aliens(1986), Back to the future(1985), Dune(1984),The Fly(1986).. etc etc. They look oldish and cheap now, but they still gives me what is important for being creative. It’s obvious I love them because I experienced them through all my teens, when most influential term of life. Those movies surely had impacted my sense of beauty that I later know through my photography. Fading City(2013) :This was from my early works. At that time I did color alternation until what I was comfortable. Later I knew these color were my love from SiFi movies. One time I noticed that my night photography had hugely influenced by my favorite SiFi movies. For me what I’ve seen, what I’ve listened; especially visual and sound are most important aspect of creating an art. Below two images were born from my love for 80’s SiFi movies. You can find your favorite color combination just with your sense, feeling, but using Adobe Color Wheel, you can much faster find your taste with rational way. This is the great free tool which you can learn the color rule. You don’t have to follow the rule always, but most cases the rule makes sense and convincing. The images below, I alternated colors based on these color scheme, using only Lightroom. These days it’s super easy to capture a great night shot thanks to great cameras and lenses. But If you are not satisfied with just having a beautiful picture, why don’t you add your favorite taste to them. Listen your inner voice carefully. Keeping make the subtle difference, you will find a big difference in the end. Just one day in every Autumn, they open the abandoned tunnel for public. I visited twice there, and every time they gave me a great experience. The Entrance of the tunnel. Many were waiting the opening. Usually the event takes place in mid November: this year on 12th. Nov. The tunnel locates around Kobe, near by Egeyama-park. Anybody can visit the tunnel, though the location is a bit tricky for tourists. That’s why I thought it might be helpful for travelers who want to visit this great abandoned tunnel, if I would guide them. So I planned the small tour. I’ll pick you up and take you guys to the location,and of course gives you some tips for shooting. If you are thinking of visiting there by yourself, I’ll give you some tips beforehand. Fortunately they allow us, photographers, to use tripod. The inside of the tunnel was not pitch-black, but you can’t get any quality photo without a tripod. Since the pass was bumpy and wet, plus other people or photographers, you should take care of where you set your tripod. the explore is just beginning. More gorgeous scene is awaiting for you. Many people come to the tunnel to shoot on the day. So it would be merely impossible to avoid people to shoot. You can find many pages for describing the technique, so allow me to pass to description and let me just introduce one. You can’t eliminate people with long exposure completely. A photographer settle for his or her shoot, and stack the place for a while. So I recommend to shoot them as an essence in your image. Blurred people sometime gives the image much unique than a completely clear image. Add people as an spice for your image. 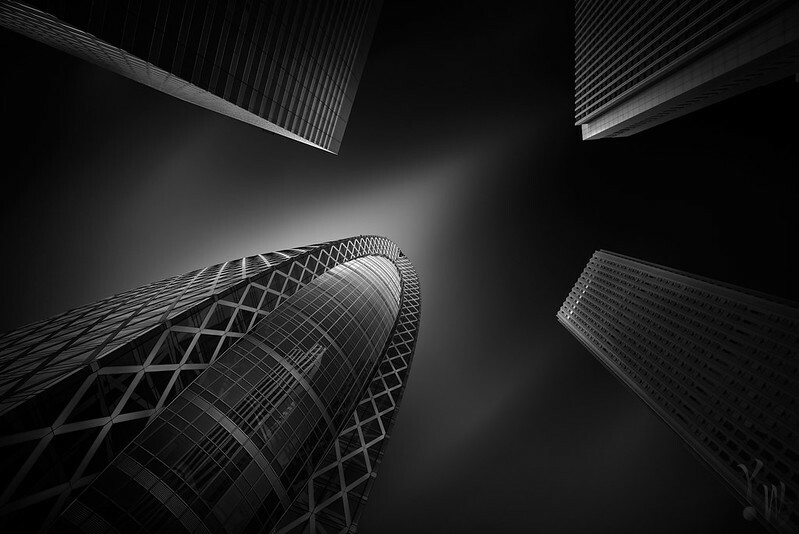 “Alone in the Darkness” by @YoshihikoWada. Actually I don’t want so many people come to the tunnel. Since the place is getting popular, the place is getting crowded with unruly photographers. Anyway I myself is going to visit the tunnel again, so if you are luckily on that day in Osaka or Kobe, why don’t you join the tour? There are two most famous junctions in Japan: One is Hakozaki(箱崎), and the other is Awaza(阿波座). I introduced Hakozaki, Tokyo, the other day, so this time is “Awaza”, Osaka where is my hometown. Awaza is not a normal sight seeing spot in Osaka,and probably your wife or girlfriend wouldn’t like it. But if you love urban scape , I strongly recommend you to visit there before you leave the town. Awaza Junction is located very near by Awaza station, then the access is pretty easy. Even it’s your first time to visit Osaka you’d never lost the way to Awaza. After visiting Osaka castle, pretty nearby, your next destination is here, Awaza. Check the root. You don’t have to hassle to visit there. Wait until the night. Night is the time when you can capture Awaza with most beautiful way. Angle view finder is nessesary. I want a D750! The tips for have an ideal light trail is just shoot as many as you can. If you wasn’t satisfied with a singe shot, then merge them! I usually shoot over 50 exposures with a same composition in order to later merging them during the post-process. Export to PS, and stacked with “lighen” mode. If you want to observe the structure of Awaza much more, come to daytime, and try Black and White to enhance its complicated structure and details. 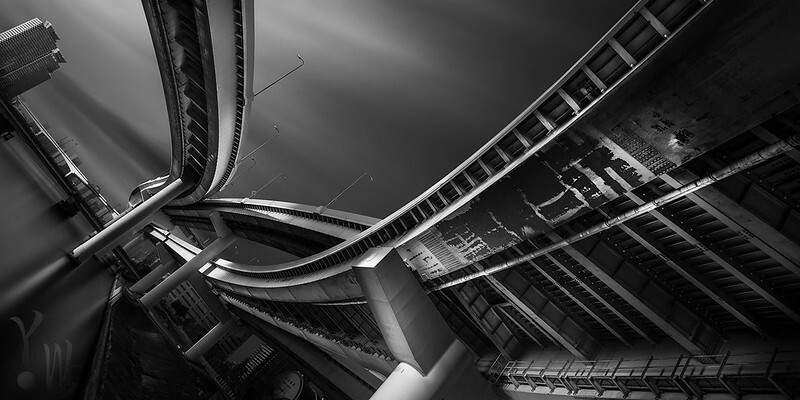 This is the place my Black and white long-exposure Junctions series”Calculated Chaos” came to my mind. D600 , 14-24 ultra wide lens with lucroit filter adapter : waiting a cloud.I almost gave up, but one cloud came after 3o minutes waiting. If you’d ask me what is the most important aspect to be a better photographer, my answer is here:persistence. When I took the photo” Medusa’s soul”, there were no clouds at all in the clear blue sky on the hot summer day. however I really needed a blurred cloud between the concrete roads above. I took 4 “5 minutes-long exposure shots” without any cloud, however I finally got one cloud in the frame. 5 minutes long exposure without any clouds doesn’t make sense at all. It just gain massive noises. I’d be happy If you had some interests “Awaza”. Have a nice holiday and Merry Christmas!! My recent series “Calculated Chaos”, It’s featuring three famous junctions in Japan. This time I introduce “Hokkou(北港)　Junction”, located North Bay junction, Osaka. Obviously, the junction is not a sight seeing spot, but nearby there are popular amusement park USJ, Universal Studio Japan. Then if your kids want to go USJ , why don’t you spare time to see this crazy urban architecture? This is not my destination. It’s industrial area. Wear Mask! It’s a messy place, actually I don’t recommend the place for a tourist who all the way come to Osaka for the first time. There are many beautiful and unique spot in Osaka and Kyoto. But you are the one who strangely be lured to these place, this is the place you have to visit. I want to travel light,(though it always ended up so light after all) so when I ‘m planning to walk a lot for the destination, I prefer D600 instead of D800E. ETC: camera tape,blower,remote, battery ×2, custom black cloths(for preventing light leak) and Chucho bars for recharge.There are no convenience store nearby, so please get some water in advance. Next time I’ll write about my favorite JCT, Awaza, Osaka. These days most of my photos are black and white or cyan based pics, or sometime selective colors. I devoted myself to Black and White, but let me take a little break to immerse in the saturated colors in this short colorful time, then I’ll be back to the world of monochrome with full of energy. This pic”Autumn Break” was taken by near by my home, Minou valley TODAY! , and finished developing today!! I usually took a few weeks or even months for a one pic, so it’s surprising to me. First things do fast, Autumn ends so rapidly so I’d like to show you asap. There is enough space so let me introduce another my autumn pics. Black and Red by Yoshihiko Wada on 500px.com This is my favorite water fall, Minoh water fall. I wish you can feel the beauty of “Zen” from the combination of the red maples and the texture of black rocks. How about this? I love the vortex made by fallen leaves. I fell in love with them. The autumn will end fast, so let’s immerse yourself like him before the cold winter comes. Fukoku-Seimei building locates in center of Osaka city. The building is so stand out because of its unique structure designed by Dominique Perrault who is famous for the designer of National Library of France. The left building is Hankyu-Umeda department store building. Black and White really suites the building. During the night, the illuminated building shows different expression. Very nearby, there is the unique “Hep Navio”building. Inside of the building,”forest image” interior makes you relax. The smallest compcast system of long exposure, which verty handy for a city shooter. coolpix a with Firecrest ND 4.8 (16 Stops) 196sec. at f/11, ISO100 No color cast! I got it at Amazon USA with a very resonable price. When you visit Osaka, you should visit here and can take a great long exposure shot like this. I recently redeveloped my previous works which was already been published a year ago or more before. This is not because I am a nostalgic person or having not an idea for a new project, but because it’s a good way to improve your skill and get a fresh perspective. A developing software is progressing day by day. today’s rapid progress of soft wares and convenience of online update. Do you know that the original Lightroom didn’t have the set of such tools: graduate filter, adjustment brush, or radical filter, which we are using as the obvious way currently. Taking advantage in those technological improvement, and use them for redeveloping your pics, you will be able to produce better result than which you did before the technology. Improvement is just not for a term for a software, but for a human too: Being able to see the progression of ourselves is most beneficial for the redevelopment. While you are reworking you’ll see how you can do faster and better than what you did it for the first time. This was the original version of the front image. This was taken and developed in 2013, almost two years ago. At that time I’d just started architectural(kinda) photography and even didn’t know black and white fine art genre at all. I wanted to pack everything I captured at that moment. However the feeling often betrays us. In order to see your picture objectively often requires certain amount of time after you finished it. If you saw your “perfect” picture after a years ago, and you felt still perfect of it, the picture would have nothing left to be done. However if you felt something different, the photo had room to be improved or re-developed. in 2013 I loved HDR photos and used HDR software, HDR Efexpro, every time. I just started using Photoshop and did not have enough skill for post process. It’s natural feeling for any artists to make their work perfect. One of the great classic music composer, Gustav Mahler, often revised his music for meeting his perfection. It’s quite a common custom in the classic music composers. Sometime, yet often redeveloping goes wrong. So what should you do? Just keep the original. You can reveal the remake when it goes right (at least you feel )than the original. can get precious experience from it. Every year in summer My family and I have a short trip to seaside of Mie, where we can stay at the company’s comfortable villa. During our stay I got up early every morning and went to the seacoast nearby wanting for some nice seascapes. The morning was pretty misty, and the front glass of the lens fogged up, just after I grabbed my camera from my bag. Check your lens often in misty morning. The front glass easily get fogged up. Put on a protect glass in order to wipe the lens easily. Don’t forget bringing some soft cloth. On the way to my initial destination, the curves of a breakwater lured my eyes. So I decided to change my plan. When something draw you eyes, you should take some time and shoot them, even though you have a predecided destination. I’ve been experiencing those moment many times, and whenever I was allowed to my hunch, I never regret the result. One of the difficult thing for a long exposure shot at the sunrise is that the light condition constantly changes and it’s get lighter and lighter. A long exposure at the sunrise, the light condition changes constantly, so don’t rely on the calculated initial time by an App, or your smart brain. Reduce some seconds depends on the light condition. I decided to reduce around 30 seconds from the initial calculated time, which said 210 seconds at the first time. Look the histogram of the raw image. The high light is pretty close to blown out. If I allowed to initial caliculated time the highlight would be peaked. Get rid of the garbage (and dog’s poop) before you shoot. You can remove them in the post, but you should to it at the filed as much as possible for save the precious time. However you can’t remove garbage all the time, so learning how to remove those unwanted objects later in the post is useful. I did not need to do perfectly because I would later it “Black and White” and I knew the area would be darker. So don’t blame me for the rough edit and result. This was about 30 minutes edit. If I removed the trash in the filed it would take less than 5minutes. Look around carefully before you shoot. Remove the garbage( and poop) as much as possible for your precious time (later in the post) and the environment. The most difficult part, yet the fun part of Black and White fine art genre: you can’t see the finishing image until during the post process phase. Imagine you are now in the front of your PC with a raw image. What should you do in the first place? Do you have the “vision“? Can you imagine your picture’s finishing image? If you have a clear vision and see the end result, you don’t need to read my blog anymore, but others who want to know about your ” vision” , please keep read. There are no clear answer to “vision”, since it is intangible. instinct, anticipating, imagination, prediction, thought, experience. These words are linked to “vision”. Since “vision” is quite uncertain, but there are several ways to see it. I’ll tell you the way I do. In the first place you have to shoot a picture. However you still don’t have clear vision. How to start? Don’t worry. Just do it by hunch. Shoot what you want. Trust your way of seeing the world. You’ve already have a seed of the vision, which will grow later. First your “vision” is fuzzy, uncertain, and changes. If your “vision” starts to change, don’t be afraid. Remember “vision” move with the times, and eventually will settle what it should be. Let the vision flow until it stop. The more you work with your image, the “vision” will grow and improve. It’s like a plant. You have to care of them. But some time it should be left. It’ll take time to grow. Don’t rush, do experiments with your image. Some time it looks waste of time, actually doesn’t. All the work you did will pay later. You never reach the goal without a map. Make rough draft of the image, which is your rough vision. I do it with Lightroom, using mainly local adjustment tools. Try every possibility and, do it drastically since it’s just a draft. Enhance all the highlights, shadows, details. Find the areas you want to focus. Make a plan which parts need to be masked for later post processing. This is the rough draft: I want to enhance the tower of the bridge, and gave it maxim highlight, and vignette ohters drastically. I know it is too dark and needed to be brigher. The vision is yours but the image should be seen public, then objective viewing is necessary to make a convincing image. Easy way to see your image objectively is keep some distance from your image. Stand up and step back from your PC monitor. Close your eyes 10 seconds, then open your eyes. Is the image still what you want? Is the image look attractive? Is the image too dark or bright? Judge them like a curator. When you think your image is almost done, export other devices, i.e. , your smart phone or tablet. Small display can’t see tiny details, but gives you the strong (or weak) impression, which is the similar feeling of others, who see your image at the first glance. perspective from seeing with PC monitors. But make sure that you have to calibrate your monitor precisely, otherwise the printed image would come out look different with what you see it on the monitors. When you feel “the image has done”, leave it a day or two. Then come back and see it again. Are you still OK with this? Can you find any rough edit? If you are convinced. well done! Publish!! When you feel some parts needed to be tweaked. Do it. Don’t publish your image until you’re fully satisfied. Never compromise. Do the best what you can do right now. Then you vision will improve image by image. A selective color looks tricky at first glance but it’s not a special technique in this digital era. Some digital cameras are capable of doing selective color effect with in-camera tools. It is so effective and easily make viewer’s attention to the photo. Then you have to care of using it and not overdo. Do you remember the movie”schindler’s list”? The movie was made as a black and white movie, but the director Steven Spielberg effectively put the red in the movie. A little girl in the red dress has an important role: she represents the innocence of the Jews being slaughtered. Schindler(main character) later spots her in a pile of exhumed dead bodies as she wore the red dress. In my opinion the red also represents the blood lost by this tragic historical incident. That makes your photo much convincing. ●What if the photo with only black and white? Before using the selective color, examine your photo; “Does it really need the color?” Often a poor selective color ruins the photo. Then make the traditional black and white version first, add the color later. Take an example from my gallery. It was not bad. The green light was eye catching, and would draw view’s eye. However the main subject of the photo is the unique shape of the building, not the traffic light. So the color green can be a distractive element in this time. I decided to take over the color. ●Don’t depend on too much to the color. Take care of other parts of the photo first:composition, the details and highlights to Shadows. When the photo stands without the color, the photo might not need the color. Leave them in Black and White. use it as the killer technique which you can stun the viewers. So what parts of the color you select? To combine with traffic lights and buildings are common technique in cityscape genre. So here comes the technique you can use. Imagine this photo without color “green”. Already the picture is brilliant with beautiful composition, detail of the buildings and long-exposure blurred clouds. Adding to “the green light“, it is really an icing on the cake. Windows are also good areas to choose.They are everywhere in a building. So select a window or windows effectively make a photo much interesting. ※This pic is not a “black and white with selective color”. Coloring Lamps are also popular along with traffic lights. Those shapes of lamps are different from countries to countries. So It’s interesting to compare among these “lamp shots” among different photographers in the world. It’s up to you where to color. There is no limitation. Just do it! I’d like to say thank you for my fellow great photographers bellow for allowing me to reference their great photographs. How inspiring they are!!! For those who are new to fine-art Black and White might interested in the RAW image, which will go to the above image. Do you want to see the scene without the ND filters? here it is. Do you see how those ND filters made the scene so surreal? Anyway, before the long time post-process, you have to take a beautiful longexpousre-raw image. It needs a bit experience, but you can be soon accustomed. Have a great long exposure!!! An early bird develops a photo. I usually get up before 4 am. Yes! I am an early riser. My work place is the small corner of the living room. where always my family intrude while I am developing my photos. My day work is a sound designer for a video game company, so I usually have 2 free creative hours before I go to work. I use those premier, quiet time, for my creation, and am pretty alone in those time period. My photos, especially fine art black and white genre, usually need a lot of post process and require sufficient time to finish: Usually 10～30hours per photo. Either way, having certain amount of time in your daily life is crucial for an artist who has a day job. Time is given equal to us, and it is us to use them by worthwhile or worthless. Don’t spend too much time for WEB, facebook, and other social media. Web is a good place to publish your work and communicate with other artists. We have to take away from the WEB and get alone constantly for the sake of building our art. Rome (and an art ) was not built in a day. The more taking time for a photo to the post process, the more your photo get better? I can’t guarantee that. Get alone and close your eyes, imagine the final outcome. How to get a treasure? I’m not telling you about jewels, but the treasure: Treasure island in San Francisco. I’ve been wanted to visit this beautiful place where you can shot the Oakland bridge with San Francisco Skyline. The location is fairly popular among photographers, but there are no specific guidelines how to get there, so I have to did a homework before my visit. Google map is really useful when you are going to visit a place which you haven’t before. They never beat a real scouting, but during our travel, mostly we don’t have enough time to visit the place early on. Fortunately, you can go almost anyplace by bus in S.F. Treasure Iselnd is no exception. It took around 15 minutes from downtown in S.F. Pretty close hah? you get off from the bus here. You can shoot here for the skyline. walk back for the gate bridge. and across left side. Be careful. This is a hard part. Climb up and walk on narrow pass on the concrete wall. Actually it was not so hard. But be careful not to fall down. YES! You almost there. Just go down the steep hill. You can also down the hill and get to the shore, but I didn’t go down this time. YES!! Congrats!! This is the place I’ve been wanted to!!! I ‘m not sure this was the best root to get the destination. See the map I passed through. Technically, the area seems to be off limit area, so please go on your own responsibility. The picture is “New Toppan Zee Bridge” from my trip to NY last October. At that time the original bridge was still deconstructing, and the new one had just opened. You see, there was an old one in my picture, but the old one had totally removed recently. Most famous Manhattan bridge, Brooklyn bridge, George Washington Bridge, to name but a few there are so many bridge in NY. The Toppan Zee bridge locates pretty much far from Manhattan, so it’s hard to access for most tourist. Luckily my friend Ricardo gave me a ride and I pretty much enjoyed seeing the bridge and shooting. The park near by. It was a pretty windy day. The park is the best shooting area so far, since there are railroad nearby the bridge. If you want to capture the bridge bigger, you need a telephoto lens. The day was a pretty windy and the sunlight was so glare when we visited first time, so we revisited at sunset. The Sunlight in NY was tough! On the bridge. You can see the old one at the left. The light-up pf the bridge is also beautiful, I did not have time for shoot this time. The access was a little bit hard but if you’ve already shot popular bridges, Manhattan and Brooklyn, it’s worth to try. As I’ve just renewed my main site “Yoshihiko Wada Photography” which is built on WordPress.org. What is the different from WordPress.com and WordPress.org? This article help you understand. Anyway, now I unified my main site, “yoshihikowada.com” with my blogs. WordPress.com is quite useful and easy to use for a beginner blogger anyone like me. If you want to start your blog , try WordPress.com first. You will know what a blog is and what you want for your blog. For me I became to know that I needed more flexibility and customization for my blog. That is one reason to move. I keep this site as an archive, so if you want to see my old posts feel free to visit here. (I put the link in my new site). Thank you for following and visiting my blog until now, and if you are still interested in my blog, please visit to my new site and blog.